The Open menu provides two options to the end user; Open Format - for opening an EDD format, and Open EDD - for opening an EDD after a format has already been opened. 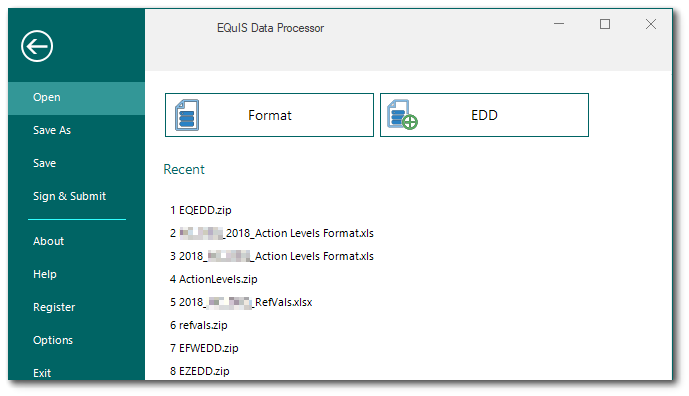 The Save menu provides up to two save options for the end user; Save EDD - for saving an EDD that the user is currently working on into a variety of formats, and for Professional EDP users, there is an option for saving Reference Values for the specific format which is open. The Sign and Submit menu option allows the user to create an Enterprise Ready EDD package once it has been checked. Opens context sensitive help to the EarthSoft EDP Online Documentation. Register allows the end user to register EDP and specific format files such as one of the distribution format files. Provides several options for customizing the color palette used during the checking process as well as core EDP functionality. Provides detailed information on file versions of EDP and basic system information.